"Despite the book's size, the complexity of its subject, and the narrative's variance with common public memory, it is a fast engaging read that corrects, even scatters, misconceptions." Franklin Delano Roosevelt became more than a man but a political machine and force of nature even before becoming president. His organization moved into the White House at a time when "voices of despair crowded out the promise of American life." Few scholars have the qualifications of Robert Dallek to tell this story. This New York Times bestselling author’s other important works include Franklin D. Roosevelt and American Foreign Policy, 1932–1945 that earned the Bancroft Prize. Winners of an election sometimes fail in governing. The Roosevelt administration's efforts did not enjoy full support "for all the talk of upheaval, little militancy actually existed." Conditions "had not been bad enough for long enough to persuade a majority of Americans to abandon the American Dream." For starving unemployed workers the "response to the Depression was not radical change." Hope became just another product, like Milk of Magnesia, but peddled by "traditional business leaders counseling renewed faith in the virtues of hard work and frugality." FDR had to "combat the Great Depression with effective federal programs that would not agitate public fears of a swing towards collectivism." New Deal programs would have to succeed with common sense, political skill, and successful communication. Beyond the self-made man propaganda, the Great Depression, and World War II, Roosevelt also struggled against a divided Democratic Party. Conflict existed about regions, machine politics, urban/rural, racism, religion, sexism, and liberal/conservative values. Franklin D. Roosevelt: A Political Life covers much more than the momentous challenges faced by FDR as president. It gives an honest outline of his life including his attitudes as a privileged "undemocratic snob" who used "the influence of men he considered unworthy of public influence." Eleanor Roosevelt had more than "glimpsed the underside of life through charitable work." 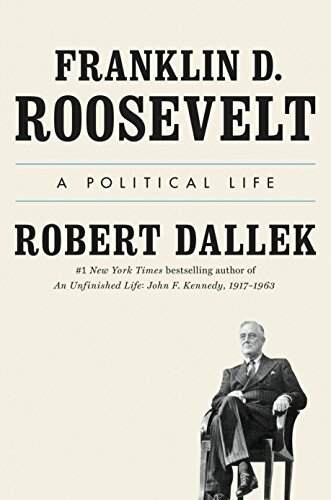 Author Robert Dallek argues though that FDR as an attorney "required him to meet, interview, and advise all sorts of people with all sorts of problems" and that brought him "at least partially out from under the shelter" of his class and wealth. Roosevelt ran for public office before he finished law school and after he and wife Eleanor had three children. He showed himself a talented political leader before he found the operative Louie Howe. Mother Sara, wife Eleanor, cousin Theodore Roosevelt etc. also played major roles in FDR's career and "his wealth gave him independence from party schisms." Dallek never loses sight of the future president's own abilities, however. A great skill FDR honed became to keep his "own counsel" in order to "advance controversial policies" when "ignorance of his aims gave" opponents "limited time and opportunity to defeat him." The author carefully measures his views. For example, he writes of Roosevelt's first inauguration as "all that Roosevelt could have wished for" but the "country was so starved for inspired leadership" that Franklin "could have said almost anything and found an enthusiastic audience." FDR's mistakes, notably with the Supreme Court and Democratic Party's conservatives, are particularly noted. The book includes documentation and a useful bibliography. Despite the book's size, the complexity of its subject, and the narrative's variance with common public memory, it is a fast engaging read that corrects, even scatters, misconceptions. The author provides an entertaining narrative in a style not unlike that of FDR. Robert S. Davis is an award-winning professor of genealogy, geography, and history. His writing credits include more than 1,000 contributions as books, articles, and reviews in historical, library, education, and archival journals related to the South. He is also a frequent speaker.